Samsung is reportedly planning to release a gigantic 13-inch tablet by the end of this year, according to Korean news source AsiaE.co.kr (via SamMobile). That would make Samsung’s tablet as large as the screen on certain laptops and tablet hybrids. Most 13-inch tablets run Windows since they’re meant to act as both a laptop and a tablet, but this would be one of the few Android tablets to come with such a large screen. Details on the device are scarce, but the Korean website reports that Samsung will use a liquid crystal display for its giant tablet rather than the Super AMOLED screen you’ll find on the Galaxy Tab S.
The main difference between AMOLED screens and LCD displays is in the way they show colours. Colours tend to look bolder and more vibrant on AMOLED screens, while LCD displays render colours in a flatter and more realistic way, as Geek.com writes in its explainer on AMOLED vs. LCD screens. If AsiaE.co.kr’s report proves to be accurate, it seems as if Samsung is trying to beat Apple to the market. Apple is expected to release a giant iPad with a 12.9-inch screen early next year, Bloomberg reported. Both Samsung and Apple’s large-sized tablets (assuming they do in fact exist) would directly compete with Microsoft’s Surface tablet. When Microsoft unveiled its latest Surface Pro 3 earlier this year, it marketed the device as a direct competitor to the MacBook Air. It essentially has all the specifications you’d find in an Ultrabook like Apple’s packed into a relatively slim tablet. 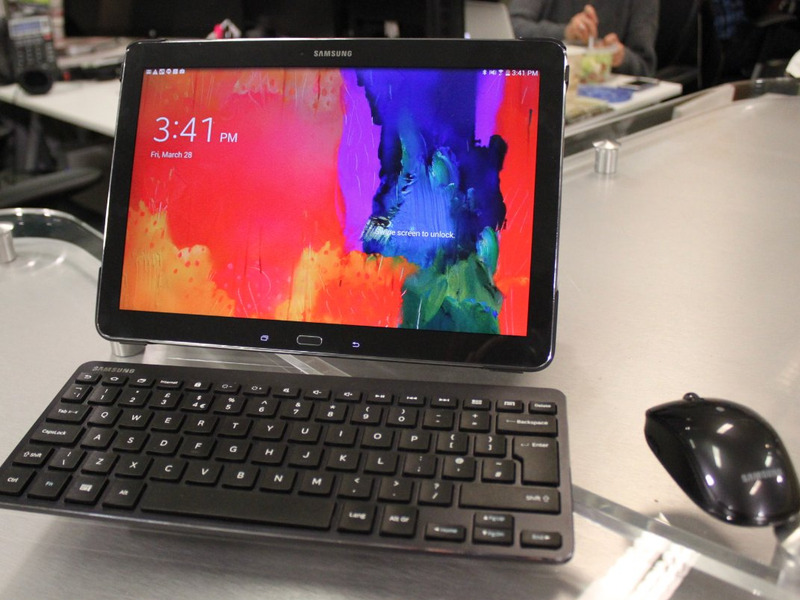 Samsung’s 13-inch tablet would only be slightly larger than the 12.2-inch Galaxy Note Pro it launched earlier this year, which is compatible with keyboard and mouse accessories sold by Samsung. It’s possible that the company is looking to launch a larger version of the tablet to prevent buyers from switching to Apple’s rumoured 13-inch tablet whenever it launches.